St Lucia has began the process of returning prisoners to the Turks and Caicos Islands (TCI) and the British Virgin Islands. The prisoners were transferred to St Lucia last year following hurricane damage to both British overseas territories. 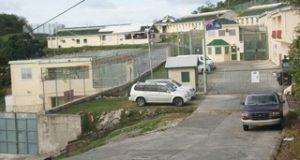 On Thursday, National Security Minister Hermangild Francis announced that one of the 24 prisoners has so far been repatriated. “Today one of them is being repatriated because his sentence in the Turks and Caicos Islands has expired, so we have to send him back. Two Marshals came from the Turks and Caicos Islands and the gentleman has been sent back – so we now have 23,” the National Security Minister explained. “We will be in touch with the Turks and Caicos Islands and the BVI as to the condition of the prisons so that as soon as we are satisfied that they are secure, those persons will be repatriated,” Francis stated. He disclosed that although housing the TCI and BVI inmates at the Bordelais Correctional Facility here comes at a cost, St Lucia will be repaid. Francis disclosed that the travelling expenses of the inmates are not St Lucia’s responsibility. He said St Lucia would ensure that the prisoners from the British colonies remain safe until they can be repatriated. However in the BVI, the government is close to completing provisions to allow for the return of the inmates of Her Majesty’s Prison (HMP). “It is time for our prisoners housed in St. Lucia to be back at Balsam Ghut where they can be in touch with their families and friends,” said Dr. Orlando Smith, the BVI’s Premier and Minister of Finance. The BVI has to pay US$78,000 to the government of St. Lucia, to accommodate the prisoners for six months.